Starting a new job is always challenging so mea culpa for my absence! Making the move to Sheridan Institute of Technology and Advanced Learning was made easy by the welcoming faculty and staff and I’m loving it! So, look for some good things to be coming out of Sheridan soon. The Faculty of Business is on the move. Now back to book reviews. 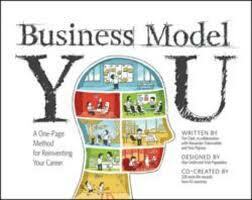 I am delighted to be able to feature “Business Model You”, a great little addition to anyone’s library. Written by Tim Clark, in collaboration with Alexander Osterwalder and Yves Pigneur AND 328 work-life wizards from 43 countries. And yes, I am one of the work-life wizards–a small contribution to the process. Following on the success of Business Model Generation, this little gem is full of ways to reinvent your career. Its a fun read. Enjoy! This entry was posted in Corporate Storytelling, creativity, Design, emotion, Entrepreneurship, innovation, insight, Leadership, Marketing, Storytelling, trends and tagged Business, Leadership, mea culpa, research. Bookmark the permalink.